"A duel between our chief commanders… means war." Well Go USA has debuted a brand new, official US trailer for Zhang Yimou's latest film, a historical fantasy drama titled Shadow - originally Ying in Chinese. This premiered at the Venice and Toronto Film Festivals last fall, and also stopped by Fantastic Fest, Busan, and the Taipei Golden Horse Film Festival. The film is a re-imagining of the classic Three Kingdoms story from Chinese history, and is another martial arts epic. The story is about a king and the people's struggle for their rightful land, as told through the perspectives of the king, his sister, his commander, the entrapped women of the palace, and a commoner. It's filmed in a unique "Chinese watercolor" style with a muted style resembling a B&W look (though it does have some color). The cast includes Ryan Zheng, Chao Deng, Qianyuan Wang, Jun Hu, Xiaotong Guan, Lei Wu, Li Sun, Jingchun Wang. We interviewed Zhang Yimou last year at TIFF, and the film is finally playing in US theaters beginning next month. Check this out. You can still watch the original international trailer for Zhang Yimou's Shadow here, to see more footage. Shadow tells the story of a great King and his people who have been displaced from their homeland and long to win it back. The King is wild and ambitious, but his motives and methods are mysterious. His great general is a visionary who fervently desires to win the ultimate battle, but needs to lay his plans in secret. The women of the palace struggle to find redemption in a world in which they have no place. And then there is a commoner, the "everyman" around whom the inexorable forces of history swirl, always ready to swallow him up. 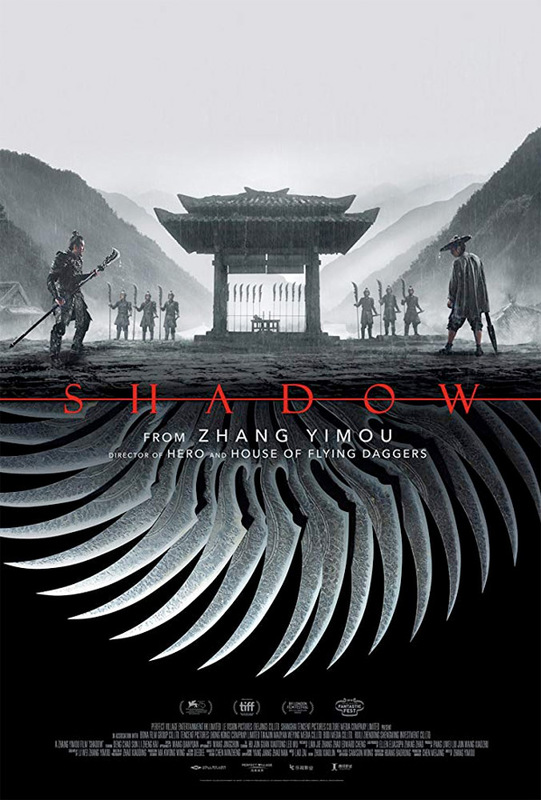 Shadow is directed by acclaimed Chinese filmmaker Zhang Yimou, of films including Raise the Red Lantern, The Road Home, Hero, House of Flying Daggers, Curse of the Golden Flower, A Woman a Gun and a Noodle Shop, The Flowers of War, Coming Home, and The Great Wall previously. The screenplay is written by Zhang Yimou and Wei Li. This premiered at the Venice and Toronto Film Festivals last year. Well Go USA releases Zhang Yimou's Shadow in select US theaters starting May 10th coming up.